The BMW S1000RR shattered the litre-class sportsbike continuum when it arrived. Just like the Yamaha YZF-R1 had in 1998, and before that the first GSX-R750 had back in the black and white days. Its timing was near-perfect too. It arrived with (holy cow!) nearly 200PS of power, a raft of electronic rider aids to make all that power manageable at a time when the Yen was steadily choking the Japanese big bikes. A potent competitor arrived at exactly the moment when the old masters were at their most vulnerable. The results, whether in terms of sales, street cred or media reports, speak for themselves. What happened next is still more fortuitous for the European bike makers. On the one hand, Aprilia joined the game with their excellent new RSV and Ducati rolled out the Panigale, while Honda, Yamaha and Suzuki more or less stopped rolling out the biennial ground-up litre-bike updates. 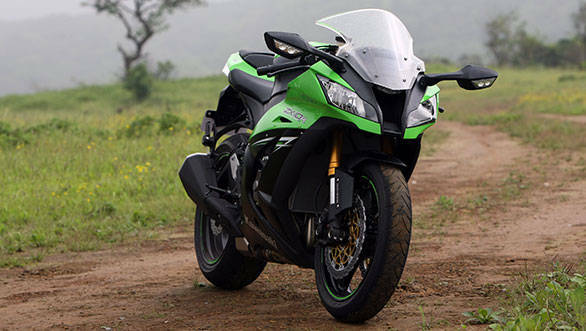 In 2010, the Kawasaki ZX-10R was fading away. But 2011 brought with it a new Kawasaki Ninja ZX-10R. And it clearly took aim at the BMW S1000RR and drew upon Kawasaki's racing activities for electronic systems. What we have here is the 2013 model. It boasted that kind of power and at launch was just over 10kg lighter than the nearest competitor. Japan was finally ready to stare down the awkward eyes of the new German king of the sportsbike hill. 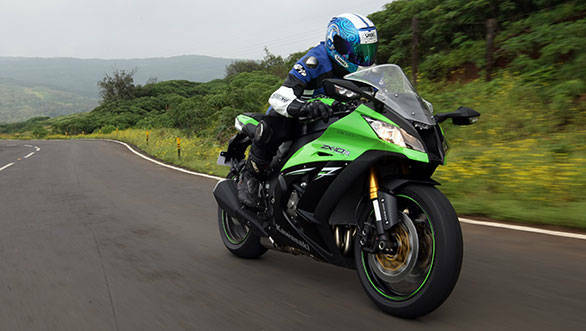 Every bit of the Kawasaki ZX-10R is cutting edge - there is no other way to stay relevant in this segment. The frame is made of seven cast pieces that make the twin spar frame. Upfront is Showa's big piston fork, aka BPF, a race-derived suspension unit that uses a piston roughly twice the size for great feedback, quick reactions and effortless performance. In this setup was a new oversquare 998cc engine with bigger intake valves, a lighter, re-positioned crank, light pistons, huge throttle bodies and a set of race-spec titanium exhaust headers. A motorcycle that from every molecule of its tyres to the plastic panels is designed for ultimate high-speed performance. KIBS uses Bosch-built ABS unit that is much lighter and half the size of a standard ABS unit. The ABS unit is placed behind the left engine cylinder close to the centre of mass to minimise the effect of added weight. Kawasaki even noted proudly on its launch materials that all the rider aids were designed not so much to prevent the rider from coming off the bike as to ensure that all possible engine power was put to use in making the motorcycle move forward stronger than before. The fact that the electronics could help prevent, for instance, highsides was almost a subtext. A vital part of a 200PS motorcycle but not the core of the system's intent. And now that I've been on the motorcycle for about 200km, I can say with confidence that the ZX-10R is ridiculous, if not impossible. When you first cast eyes on it, you'll think of it as a hard-edged, even brutal 600. And that is roughly the size of it. Compared even to the ever-shrinking litre-bikes, the Kawasaki looks (and then feels) small, manageable, and once off the side stand, extremely light. The tail end is compact while the fairing has huge cut-outs through which you can see the already blueing headers. It's beautiful in a brutal, purposeful way but pretty it isn't. Then you get rolling and you have to do an immediate expectation reset. You see litre-bikes aren't supposed to be comfortable, they're built for performance. So they have heavy clutches, extremely committed ergonomics, and usually need a good five minutes of time so you can figure out how to arm wrestle them around. But the Kawasaki ZX-10R needs none of this. The clutch lever requires almost no effort, and the way it releases feels more like an extremely well-made small-displacement bike than a 200PS guided missile. The engine is quiet and stunningly smooth off the bottom, while the sense of weight and mass disappears almost entirely at 1.5kmph. About 300m after you get on the motorcycle, you're itching to nail the throttle to reassure yourself that you have litre-class ferocity on demand rather than what feels like a rebadged 600 or smaller. This in itself is amazing because a lot of riding fast has to do with your confidence level. The more of it you have, the faster you will usually go. The Kawasaki ZX-10R starts off feeling friendly, unintimidating and light on its feet, and it - and this is the super-awesome bit - manages to stay like that when you've upped the speeds considerably as well. Making a 200PS superbike with today's technology and electronics isn't difficult. 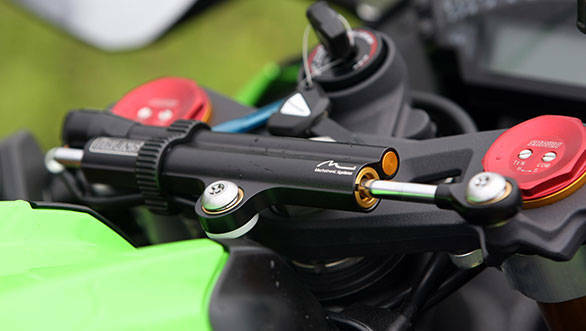 Making it feel easy to work with is, and Kawasaki have nailed this part. 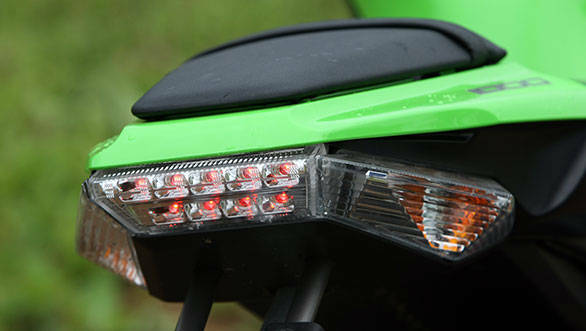 And this reflects in every aspect of the motorcycle. For instance, the meters show a bewildering array of information but it is neatly organised; so after a minute or two, you see what you need to quickly. In race mode, you see a gear position indicator bang in the middle, while in normal mode, the speed readout takes centre stage. My favourite bit is the rev counter. It is the part of the instrument I use the most until I get used to shifting by sound, and the Kawasaki has about the best rev counter I've ever used. A band of bright LEDs make an arc across the top with one bar illuminated at idle. Pick up the revs and more LEDs light up making a light bar that arcs rapidly from left to right. 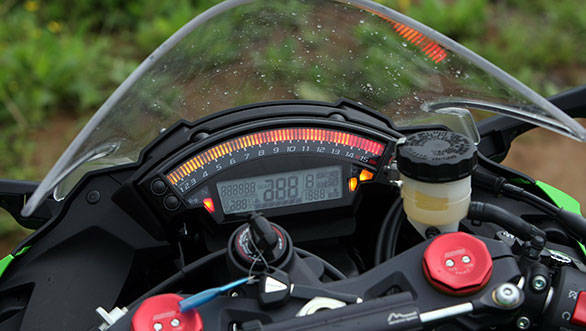 As you get into the 10,000rpm area, the colour changes towards orange and then turns red near the 14,500rpm redline. It's easy to track even in peripheral vision, the colour is a good indicator of how far from the redline you are, and I honestly cannot say if there is a shift light or not because I never needed it and never shattered off the rev limiter either. Everyone should just close their eyes and replicate this. It's perfect. Almost as great is the engine. Throttle response is quick but not electric which means modulating power, especially coming back on the gas while on the edge of tyre, is remarkably smooth and natural. I was initially worried because we were the first to ride the bike which means zero kilometres on the clock, tyres still greasy from the mold release compound... a bad time to be figuring out how much throttle is enough on corner exists. A good time to have traction control on your side. But not only, despite my best efforts, did I never get to trigger it, but the connection from throttle to rear wheel felt so natural that I almost fooled myself into thinking that I was a skilled superhero. In fact, the people really wearing the underpants outside are the Kawasaki engineers. The engine feels generous but easy at the bottom, and it builds to a fantastic, ferocious top-end without losing its graceful linearity. I stayed in full power mode throughout, though I had the option of making normal street riding easier by switching to medium (less power but full power available if needed) or low (much less power for slippery conditions). The bike was brand new so we only redlined it a couple of times and chose not to test it, so Sport-Kawasaki Traction Control (S-KTRC) never got to really show its hand. But from what we are hearing, it's work of art. 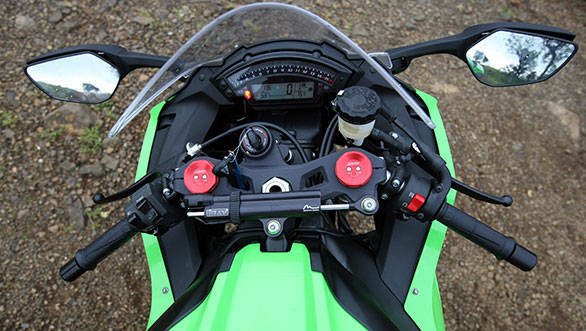 It gathers information on the bike 200 times a second and in mode 1 (least interference) even allows a bit of wheel slip, which maximises power delivered to the rear wheel. And its genius seems to be that it feels completely natural doing its work unobtrusively, so you can carry on playing the fool and looking like a hero without highsiding yourself into the future. But this kind of power in a small and light package isn't an automatic victory. The BMW S1000RR in its first year, to wit, received a fair bit of criticism for having a difficult chassis to live with, and the Panigale R, similarly, is hard work though extremely quick. The chassis and its nature and behaviour is a huge part of the performance package. The Kawasaki, as you can read in all the stories about it, possesses chassis excellence on par with its engine or indeed, it's electronics. The BPF reveals the nature of the road so clearly that your confidence in it is sky high. This I discovered as I breached 150kmph over a crest and discovered to my horror that the road ahead had descended into post-monsoon disarray without warning. But in a flash, I was through the patch without a flutter, while I was expecting to be thrown up and out of the seat momentarily. The suspension absorbed the abrupt change in surface so amazingly well! It isn't just sudden big bump absorption either. 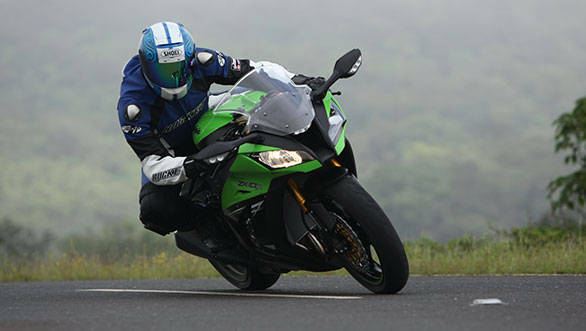 For a full on no holds barred sportsbike, the ZX-10R feels almost plush. Normal roads are dealt with graciously and low speed ride is sporty but excellent. And then after your first 150kmph sweeper you also note that high-speed ride is just as firm as you expect without the slightest hint of a wallow or softness. Once again, it's a delicate balance that makes the Kawasaki easy to live with everyday without compromising any of its high performance effectiveness. And it isn't over yet. 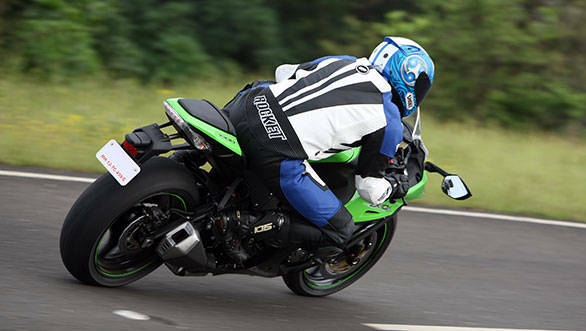 The Kawasaki, despite its substantial wheelbase, is actually very, very light on its feet. In traffic, as Rishaad put it, "It's no harder to ride quickly than an R15, though much quicker!" As ludicrous as that sounds, it's true. Changing direction swiftly to make a late-spotted gap requires no effort, and within moments it becomes an extension of you rather than the usual - oh god this big, hot motorcycle is going to kill me. To its credit, it also seems to run noticeably cooler than its peers. Only once in heavy traffic did we see coolant temperatures hit 104 while most other bikes get to 107, the fan stays on and slowly cools you. It isn't an aircon, but certainly the coolest running litre-bike I've ever piloted in Indian traffic. Out on faster roads, the Kawasaki remains a natural feeling motorcycle that turns quickly into corners, doesn't mind riders who usually ride small bikes and consequently load the front into corners out of habit. It's super stable leaned over and on the exit, the natural throttle feel and traction control make ridiculous speed stupidly easy. And I think easy is the critical word here. The Kawasaki is sheer, epic brilliance. It is how a 200PS motorcycle should feel if it had to be sold without electronic aids today - fast but firmly on your side and not trying to kill you. It backs that up with an excellent set of electronic systems. You never grow tired of riding it, you never lose your faith in it, and you never think of it as anything but an easy to ride motorcycle with a fearsome turn of speed. If I had the money, I'd be at the Kawasaki dealer by now. Which brings me to the final trophy in the Kawasaki cabinet. Unless you're a fan, there really isn't any real point in considering the other Japanese litre-bikes until they receive comprehensive updates. But at Rs 15.7 lakh ex-Pune, the ZX-10R not only matches the performance of the Aprilia RSV or the BMW S1000RR, it also is vastly cheaper to buy. Most importantly, however, it is a motorcycle that is easy. Easy to ride in traffic, easy to get along with, easy to ride quickly and easy to exploit at the racetrack. Which means you're far, far more likely to ride it. 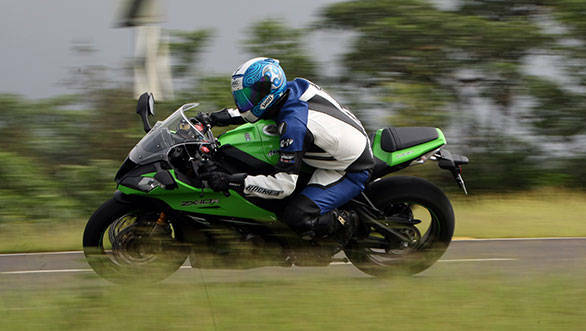 An easy to live with 1000cc sportsbike that you could ride everyday in India? There goes the continuum once again.